Tonight on the History Channel VIKINGS continues with another episode called, “The Choice” On it, Ragnar’s men are engaged in battle while marching to King Ecbert’s villa. On last week’s Princess Aslaug’s latest prophecy came true, while Ragnar and Horik had very different ideas about the true purpose of their trip to Wessex. Did you watch last week’s episode? We did and we have a full and detailed recap, right here for you. On tonight’s episode Ragnar’s men begin to march into King Ecbert’s villa, but on their way to King Ecbert’s villa his men engage into combat and are met with a surprisingly vicious welcome party. Tonight’s episode looks like it is going to be great and you won’t want to miss it, so be sure to tune in for our live coverage of The History Channel “Vikings” at 10:00 PM EST! While you wait for our recap hit the comments and let us know how excited you are for the season 2 episode 9 of Vikings tonight. Tonight’s episode of Vikings opens with King Ecbert and Athelstan discussing Ragnor’s attack on his men. Ecbert reveals that as soon as King Aello returns he plans to attack. Athelstan tries to reason with Ecbert and explains that Ragnor is a reasonable man and he doesn’t want to fight he wants farming land for his people. At their camp Ragnar is discussing the attack with King Horik, and he is not pleased. He explains that now they can’t negotiate with Ecbert. Horik reveals he never had any intention of negotiating with King Ecbert, he wants to kill him. Lagertha tries to reason that if they defeat Ecbert they could receive even more land. Floki takes King Horik and Lagertha’s side. Ragnar says he is going to go alone and talk to Ecbert. King HOrik forbids him to do so and says they are attacking King Ecbert tomorrow. Bjorn discuss the battle with his father, Ragnar says that he spoke to a seer and Bjorn will not die tomorrow. Floki and King Horik are having a conversation of their own, King Horik gets inside Floki’s head and convinces him that he should kill Bjorn. 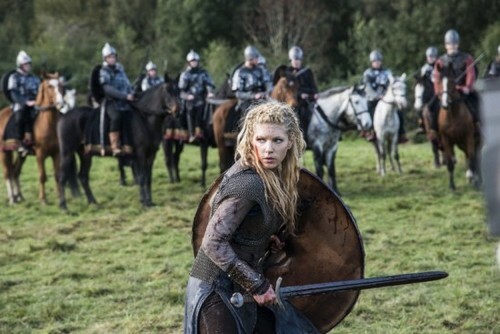 The next day Lagertha, Ragnar, King Florik and their men march to battle Ecbert’s men. Ragnar and his men want to hang back, but Florik insists. They march down a hill and realize it is a trap and Ecbert’s men have them surrounded. They begin fighting for their lives. Soon even more of Ecbert and King Aelle’s men arrive and a blood bath ensues. Rollo is murdered, and Lagertha, Horik, and Ragnar and the few men they have left retreat. After the battle Athelstan wanders the field surveying the bodies. He discovers Rollo’s body and calls out that he is still alive. Ecbert tells the preacher to try to fix up Rollo and see if he can be saved, if he lives they can use him as leverage. Meanwhile Ecbert and his men are celebrating their victory. The next day Athelstan heads to their make-shift medieval hospital to check on Rollo. Rollo can barely speak, but he manages to tell Athelstan that if he had enough strength he would kill him for betraying them. Athelstan rides out to Ragnar and King Horik’s camp. He reveals to them that Rollo is alive, they are taking care of him. Lagertha asks why he would come, Athelstan insists that King Ecbert wants to talk with them and negotiate. King Horik and Floki mock Athelstan, but Lagertha says she will meet with Ecbert even if King Horik won’t. Ragnar walks Athelstan halfway back to Ecbert to protect him. He gives him back the bracelet that Ecbert gave to him and tells him that he hopes one day they will share the same Gods. On the way to their meeting with Ecbert Floki rants about how horrible an idea it is to meet with him. He is annoyed that they are walking into a potential trap just to save Rollo. King Ecbert gives them King Aelle as a hostage and insurance policy, and they head inside to discuss a treaty. King Ecbert offers to pay them for peace, give them 5,000 acres, hand over Rollo, and hire their men to join his army. Lagertha and Ragnar, accept the terms of the treaty. King Horik begrudgingly goes along with it. As they are leaving Ragnar asks Athelstan to return with him. Lagertha, Ragnar, and King Horik return home with their men and are greeted with open arms from the women they left behind. Athelstan joined them because he wanted to “return home to his family.” Siggy begins tending to Rollo’s wounds and breaks his leg back in place. Bjorn is surprised to see that Princess Aslaug has freed his servant girlfriend so they can be together. King Horik takes Floki aside and tells him he has a proposition for him.